Africanized honey bees (AHB) — also called Africanized bees or killer bees — are descendants of southern African bees imported in 1956 by Brazilian scientists attempting to breed a honey bee better adapted to the South American tropics. When some of these bees escaped quarantine in 1957, they began breeding with local Brazilian honey bees, quickly multiplying and extending their range throughout South and Central America at a rate greater than 200 miles per year. In the past decade, AHB began invading North America. Africanized bees acquired the name killer bees because they will viciously attack people and animals who unwittingly stray into their territory, often resulting in serious injury or death. It is not necessary to disturb the hive itself to initiate an AHB attack. In fact, Africanized bees have been known to respond viciously to mundane occurrences, including noises or even vibrations from vehicles, equipment and pedestrians. Though their venom is no more potent than native honey bees, Africanized bees attack in far greater numbers and pursue perceived enemies for greater distances. Once disturbed, colonies may remain agitated for 24 hours, attacking people and animals within a range of a quarter mile from the hive. only experts can tell them apart. The first swarm of Africanized bees was detected in the U.S. in October, 1990 when they were captured in a baited trap at the border town of Hidalgo, Texas. 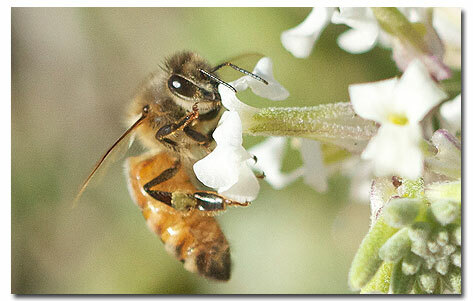 AHB colonies were first reported in Arizona and New Mexico in 1993 and in California in October, 1994. Within a year, more than 8,000 square miles of Imperial, Riverside and northeastern San Diego counties were declared officially colonized by Africanized bees. To date, more than 100 counties in Texas, 6 in New Mexico, 14 in Arizona, one in Nevada, and three counties in California have reported Africanized honey bees. AHB continue the northward expansion of their territories by swarming, the process by which bee colonies replicate. In May of 1991, Jesus Diaz became the first person to be attacked by AHB in the U.S. while mowing a lawn in the border city of Brownsville, Texas. Diaz suffered 18 stings and was treated at a local hospital. On July 15, 1993, 82-year-old Lino Lopez became the first person to die in the U.S. from Africanized honey bee stings. He was stung more than 40 times while trying to remove a colony from a wall in an abandoned building on his ranch near Harlingen, Texas. Arizona’s first human fatality from Africanized bees occurred in October, 1993 when an 88-year-old Apache Junction woman disturbed a large Africanized honey bee colony in an abandoned building on her property and was stung numerous times. Although such fatalities are alarming, Africanized bees probably present a greater danger in the U.S. to American beekeeping and American agriculture than to humans. AHBs often enter European colonies to mingle and mate with them. Such mating results in more hybrid bees having African genes and tendencies dominating over European ones. An entire colony may suddenly take on aggressive and short-tempered behavior.